One of our favorite things about RandBall and its commenters is the diversity of talents. And here to bring that fully to light is Fasolamatt. Sir? According to startribune.com, I missed a Gophers game, a Twins series win, and some sort of BrettFavre BrettFavre BrettFavre event on Sunday (apparently this was important enough to be above the fold on both newspapers that I didn’t purchase at the Bean Factory Monday morning). My exposure to this was two minutes of Dark Star recapping on Saturday, and three minutes of Cory Cove doing the same on Sunday, so I’m not going to be able to shed any light on recent events. As you can see in the photo, it’s a mixed bag of folks (about 125) and (as you can’t see in the photo) it’s loud. Here’s the trailer from a documentary about the singing, and here’s a video of yours truly earlier this year in Chicago and a priceless video from earlier this month in Alabama. What did you do over the weekend? [Proprietor note: For some reason two of Matt's links were "blocked" for explicit content. 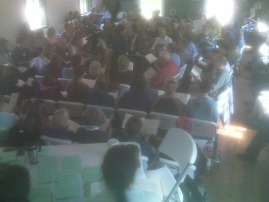 Both of them were variations of the Minnesota State Sacred Harp Singing Convention site. We're sure this is just some sort of glitch in the Matrix. Or there's more about this society than meets the eye].